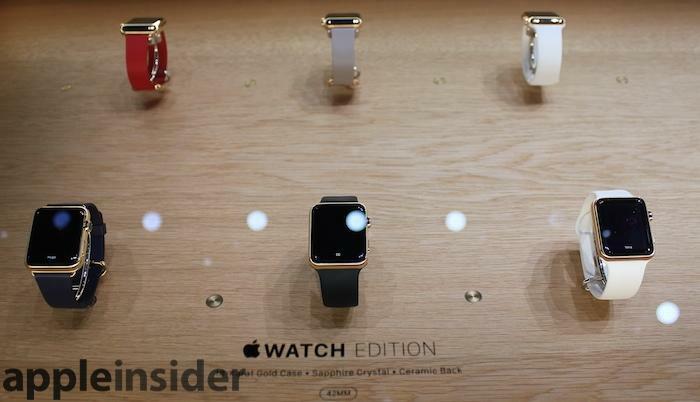 Apple's unveiling of its new watch is unique in two respects. First, it only comes in one technical version. There's no model differentiation in memory capacity, processor speed, display resolutions or in sensors across the entire lineup of devices Apple plans to sell. In fact, they all use the same electronic package inside, which Apple calls "S1," comparable in some respects to the A8 chips powering its latest iPhone 6. The difference is that virtually everything in the new watch is in the S1 chip, not just the primary processor cores as is the case in the Ax-powered iPhone and iPad. Secondly, there is incredible diversity in non-technical versions of the product. For starters, there are two device sizes, distinguished solely by display size rather than by functionality. Apple also makes no effort to associate the two sizes with specifically assigned gender roles, so individuals can choose the size of their watch as a personal preference. 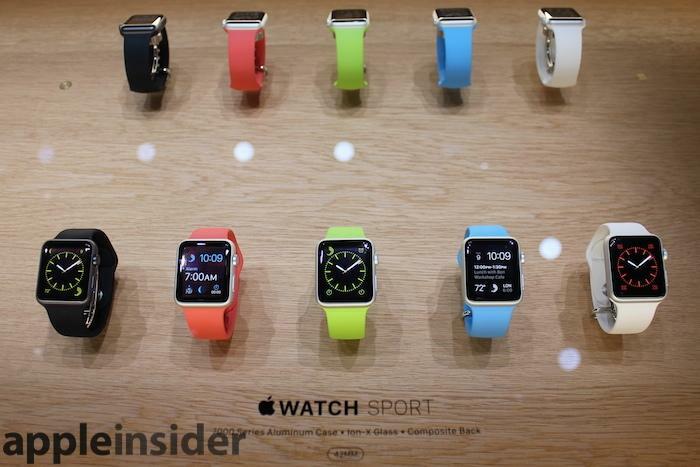 Second, Apple offers its watch in three different material combinations. The first, WATCH Sport, uses lightweight aluminum in either a silver or darker "space grey" finish, with a hardened glass face Apple refers to as "Ion X" and a rear composite cover. The middle tier, called simply WATCH, uses "316L stainless steel" for its body, a particular jewelry grade of low carbon stainless that incorporates molybdenum to resist corrosion. 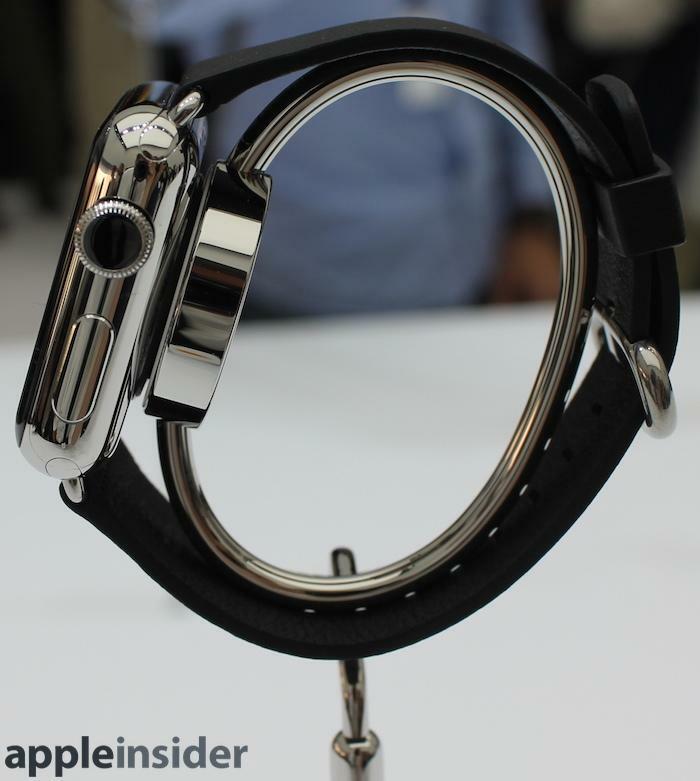 It will be offered in a standard stainless a "space black" stainless finish. It also adds a sapphire crystal face and uses a ceramic back. 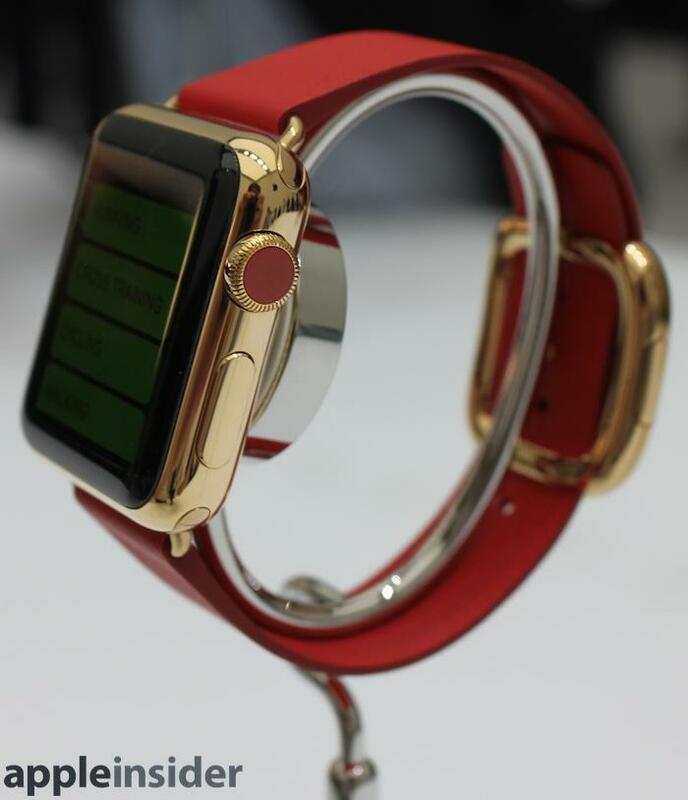 The highest tier, which Apple calls WATCH Edition, uses an 18 karat gold body formulated for hardness, available both in a yellow gold and rose gold finish. Both tones are more distinctly gold than Apple's iPhone 5s, which in comparison looks very subtle in its champagne goldness. It too uses sapphire crystal face and a ceramic back. All three editions are available in both of the two sizes. Apple also offers a half dozen different, interchangeable watch band styles, ranging from the supple plastic strap that comes standard on the Sport versions, to a variety of leather styles and colors including a variable magnetically segmented style and classic buckle type. 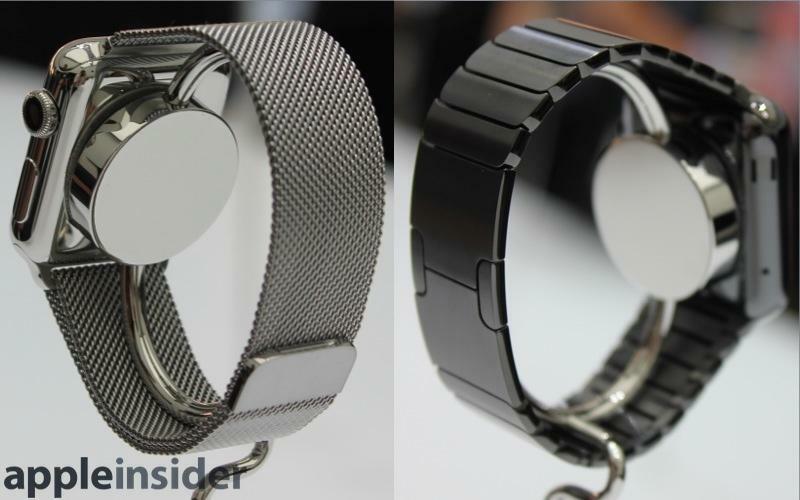 Certain Edition models will come with exclusive band styles featuring metal buckles, while Apple also offers a mechanically segmented band that snaps into place with precision, and a Milanese chain band that uses magnetic attraction to connect around your wrist. While all of the bands of a matching size will fit any of the three editions, Apple said it will package specific models with matching bands, and in some cases exclusive band styles. All together, this will result in the largest range of different SKUs of any product Apple sells. This is one aspect of "our most personal product" marketing line Apple is using: extremely broad customization. When photographed, the watch looks rotund and chunky, almost impossibly too fat to even call a watch. However, when worn the experience is completely different. 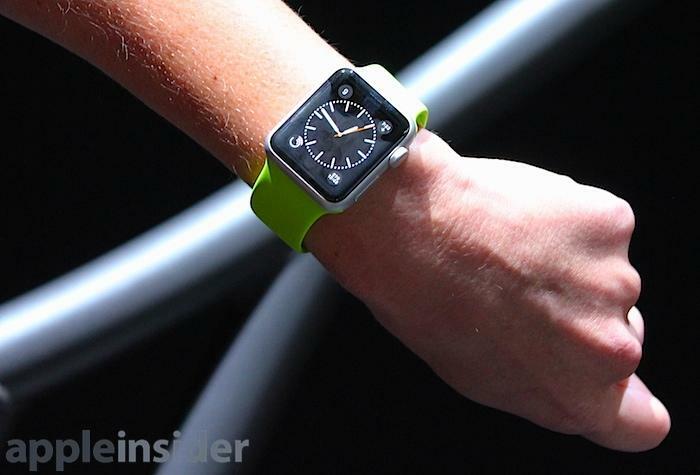 Worn on the wrist, the device feels slim. The sport version, made out of lighter aluminum and glass, feels noticeably lighter, as if its barely there. The various different bands offered hold the device in place in a way that makes it feel like a typical watch, not the steampunk diving bell of a device it looks like when pictured on a stand (below, along with an animated 3D rendering by Sketchfab artist Mestaty). 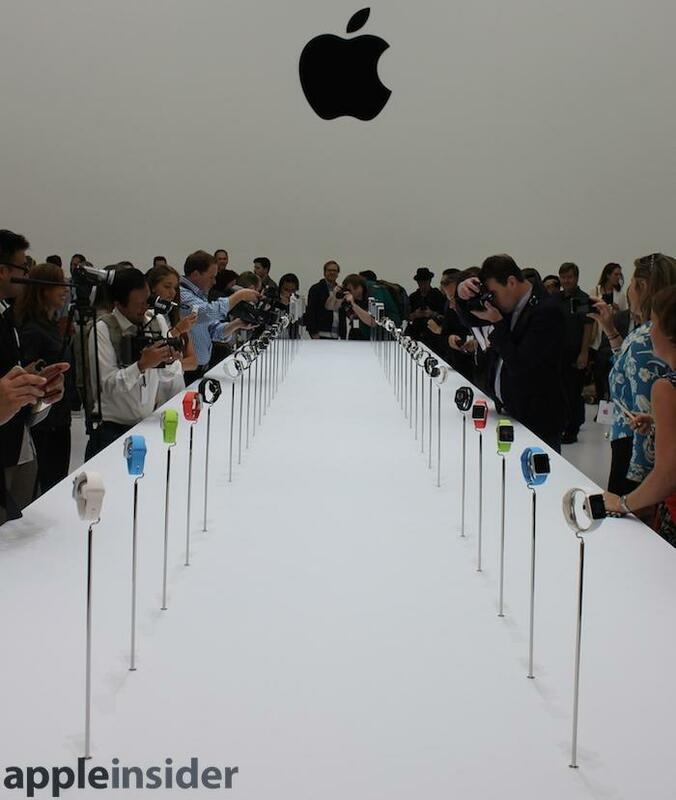 Apple's product demonstrators at the event were trained to depict functional watches on their own wrist, and attached devices to onlookers configured in a canned demonstration loop. If the product were immediately ready for sale in a way that met Apple's exacting standards, this wouldn't be necessary. The company won't be selling them until "early 2015" for this reason; It's not entirely finished yet, the same way iPhone wasn't ready when Jobs showed it off in January 2007, six months prior to the day it went on sale. Despite not yet being ready for sale, the devices Apple demonstrated showed off a product that has a deeply considered design and a well polished user interface that appears specifically intended to be fun to use, rather than just an effort to spread iOS more broadly than it already is, like Windows Everywhere back in the day, or Google's focus on Android volumes and shipment percentages. Over the next couple years, Apple's watch will likely get thinner and more powerful, just like the iPod, iPhone and iPad have, to the point where Apple's chief executive recently remarked that looking back at the original iPad is almost sort of embarrassing given the current state of the art. However, Apple sold millions of original iPads in its first year to satisfied users who enjoyed them. It is very likely that Apple won't sell similar mass quantities of the WATCH, in part because there is some finite limit on how many expensive devices the common person really needs or wants to carry around on a daily basis. Google's Android Wear partners have typically priced their own offerings at barely $200, fully aware that there is not exactly an insatiable demand for their smartwatches even at a very low entry point. 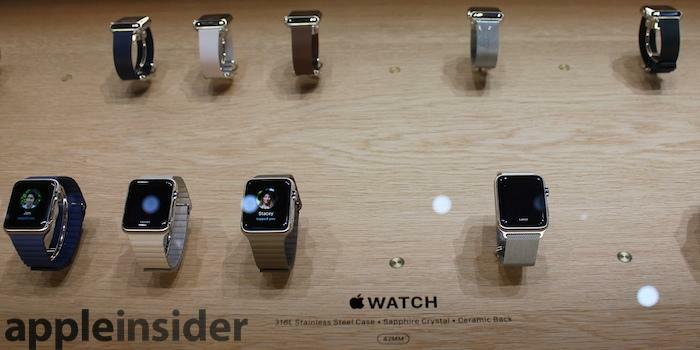 But Apple is clearly not aiming at delivering a low end watch product for the masses. 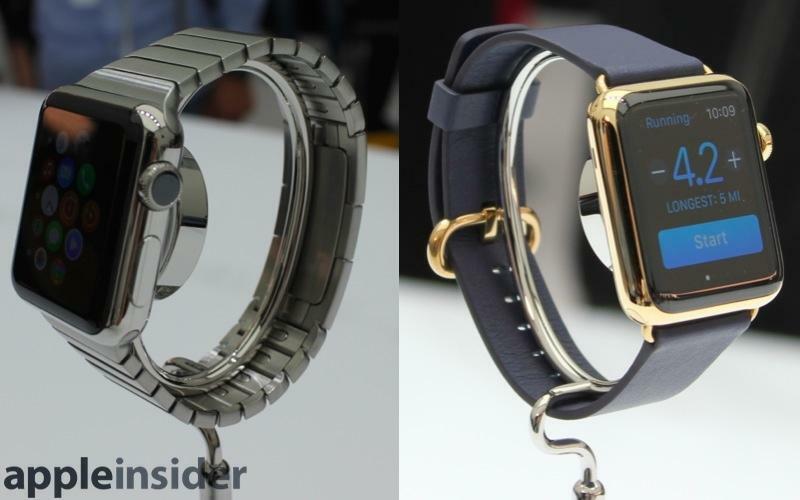 The new watch appears to be a halo product, just like the original iPod. Rather than aiming at everyone right off the bat, Apple is aiming at fashion-conscious young people and more mature individuals who are price-insensitive. Samsung, LG and Motorola are rolling out cheap plastic devices with shiny chrome on them, not sapphire-faced products using gold bodies, crafted leather bands and precision clasps that cost money. What the new product introduces is a new category of computing, one where Apple's core competency at hardware and software integration and its attention to design detail can produce a device that can be worn anywhere, not just to a BestBuy or a gadget fan convention. There are a variety of details Apple hasn't yet addressed. It implied a full day of use on a charge, but didn't provide any specific numbers on battery life. It states that the S1 system-on-a-chip design is "completely encapsulated in resin to protect the electronics from the elements, impact, and wear," without actually saying whether the device will be fully water resistant (a feature largely expected in a wrist watch). There were no details provided about the products's actual screen resolution, the specific technology of the screen or details like RAM or how many transistors it uses, facts Apple shares about some other products that it builds. The device doesn't incorporate WiFi, cellular or GPS (borrowing these battery-hungry technologies from the requisite iPhone it's paired with), but does include an optical heart rate sensor and its own accelerometer for measuring body activity and step counting. Apple didn't specify many other details about how it worked, outside of stating that it would use a MagSafe-style power adapter that used induction charging, that it would supply NFC to support " Pay" transactions (including users of iPhone 5/5c/5s, which won't be able to make purchases directly from their phones), and that its user interface is driven by the Digital Crown dial/button, a second lower button, as well as touch, pressure and flick gestures on the screen. In addition to the screen, the device also provides feedback via its "Taptic Engine," a specialized linear actuator that provides more subtle touch feedback cues than the basic vibration motor in your iPhone. As such, it's quieter and more discreet. A major complaint about existing "smartwatch" offerings is that they deliver an annoying, duplicative series of nonstop notification vibrations that simply rebroadcast every alert from your phone. The touch alerts delivered by the watch were more varied and nuanced. One example was the different vibrations used to signal a right or left turn when providing Maps directions, so you wouldn't even need to look at the display to understand what the alert was communicating. In that respect, the device's use of hepatic feedback is evolved beyond a simple buzz common on smartphones. While iPad, at its introduction in 2010, was an expansion of the iOS experience introduced three years prior with iPhone and iPod touch, the new product Apple is now calling WATCH debuts an entirely new user interface designed specifically for a watch. It's not a small smartphone strapped to your wrist. Like the first iPhone and TV in 2007, the first iPod in 2001 or the first Macintosh in 1984, Apple's new watch completely rethinks what a user interface should present and respond to in order to address a new kind of device. This is markedly different from Microsoft's various failed efforts in the 1990s to shoehorn the mouse-based windowing desktop PC it appropriated from Apple's Macintosh into various new shapes (including Windows Mobile phones), or Google's own failed efforts to stretch the multitouch smartphone interface it appropriated from Apple's iPhone into tablets or shrink it down into a "smartwatch." 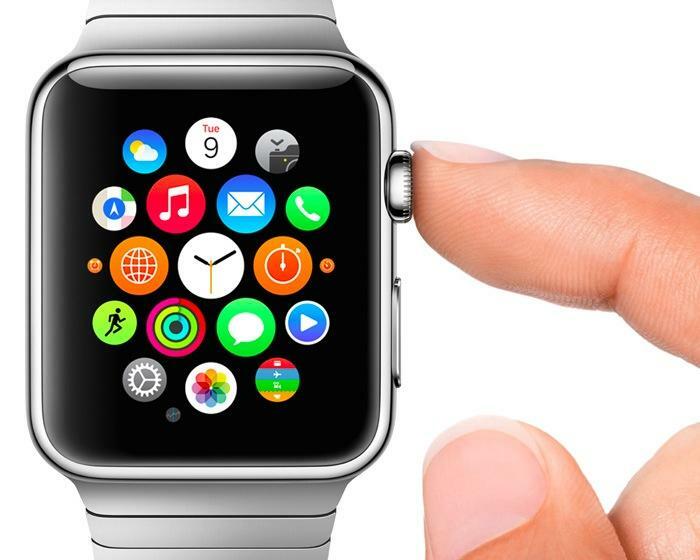 Rather than being a small iPhone worn on the wrist, Apple's watch takes the familiar iOS concepts of apps and notifications and makes them work in a wearable context by inventing a new "Digital Crown" dial controller that pays homage to the traditional watch "crown" used to wind and set a mechanical watch. Like the iPod's original click wheel, it's designed to quickly navigate on a small screen where multitouch alone would be cumbersome and a stylus makes no sense at all. Apple is also referring to individual elements in the device's interface as "complications," a term long used by expert watch makers to refer to the complex mechanical features of timepieces that could serve as a chronograph, a striking alarm or display the phases of the moon. Below, a fitness model showed off her watch face configured with four "complications" depicting information relevant to her workout. If you search Google for "Android Wear complications," all you get is user complaints and attempts by the company's apologists to make excuses for them. Google's Android smartwatch initiative did little other than to rewarm Microsoft's old, failed efforts to sell SPOT watches, an exercise undertaken to sell a platform more broadly, rather than to develop a worthwhile device people might have any reason to desire. Rather than simply down-porting smartphone apps to its watch, Apple has developed a new WatchKit development system and set of interface guidelines that has created a pipeline of a new type of mobile apps. In particular, functions are often expressed in what Apple is calling "Glances," which quickly present information with a simple swipe gesture. Similar to desk accessory widgets, Glances make data and controls relevant to a wearable device, rather than attempting to replicate entire iOS apps on a small screen. One similarity to Google's Android Wear is that Apple's watch makes heavy use of Siri, the voice assistant that debuted on iPhone 4S in 2011. At the time, Google's head of Android Andy Rubin scoffed at the concept, stating that he didn't "believe that your phone should be an assistant." After seeing how Siri helped to sell iPhones and in particular how it threatened Google's ad empire by diverting search traffic from its servers, the company raced to copy it, and deployed voice-based search as a key component of Android going forward, including its Android Wear initiative that, so far, has failed to make much progress. One thing Google will find it difficult to do is push its own search services on Apple's new watch, even as it has struggled to retain even a minority share of its its once exclusive position in serving iOS Maps and general search services.